What could be better than soaking up the rays on your beachfront villa after a quick plunge in your private swimming pool? 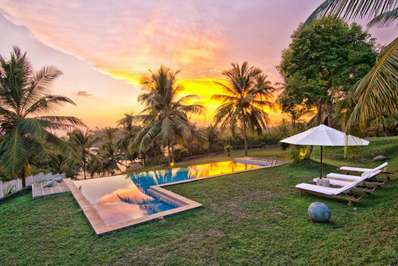 This list of luxury holiday rentals in Sri Lanka contains some of the finest villas on the island, all of which are mere meters from the sea. If watching the sun dropping below the horizon from your own opulent holiday home sounds like your cup of tea, read on! Nilaya is the Sanskrit word for ‘abode,’ and this luxurious beach villa certainly has a welcoming and homely feel which lives up to its name! This spacious two-bedroom paradise in Bentota boasts glorious sea views from its well-kept garden and pristine swimming pool. Meters from the pristine coast for swimming and sunbathing to your heart’s desire, there is also a turtle hatchery a few minutes walk through the golden sand away. One of our favourite beachfront villas in Sri Lanka for honeymoons and couples retreats, it features modern furnishings, exotic wood and a state-of-the-art kitchen. Oh – and don’t forget the services of a specialized Sri Lankan chef! If falling out of bed to stroll along golden sandy beaches is your style then you’d do well to do better than Skinny Beach House, a chic and stylish villa situated on Sri Lanka’s palm-fringed southern coast. Inventively designed to create space on a narrow plot, this villa has direct access to arguably one of the best beaches on the island, which is why it is one of our favourite holiday pool villas in Sri Lanka. The stylish living spaces mix designer furniture and bespoke fittings crafted from local hardwood, which results in an elegant aesthetic. Only a few steps away is the powder soft beach, where protection from the stunning reef creates a calm lagoon – perfect for an early morning dip. For fans of simplicity, Wollamai Beach House is sure to be a favourite. Stunning views, a beautiful infinity pool and roomy open living areas – it’s as simple as that! Featuring a unique blend of minimalism and luxury which you are unlikely to find anywhere else, this holiday resort is kitted out with three king-sized bedrooms and a double bunk which sleeps four, meaning it is perfect for families with children. The villa is also stocked with kids toys, games and beach gear! The infinity pool, shaded by coconut trees and stretching the length of the villa is perfect for a quick dip before enjoying some cocktails and looking out for turtles in the Indian Ocean. Both the king bedroom and master suite feature breathtaking panoramic views from their private decks on the first floor. A true taste of affluence! Imagine an isolated paradise surrounded on three sides by swaying palm trees and opening up to a glorious stretch of virgin beach on the fourth – meet our Sharavi Beach Villas. Your personal gateway to the turquoise waves of the Indian Ocean, each of the spacious two-story villas here features a three-bedroom suite with en-suite facilities. The lower bedroom suite boasts its own enclosed terrace, whilst those on the second floor each feature a private balcony. Perfect for dining and reclining with the sound of the waves playing gently in the background, the spacious living areas give these villas an incredibly sociable feel. 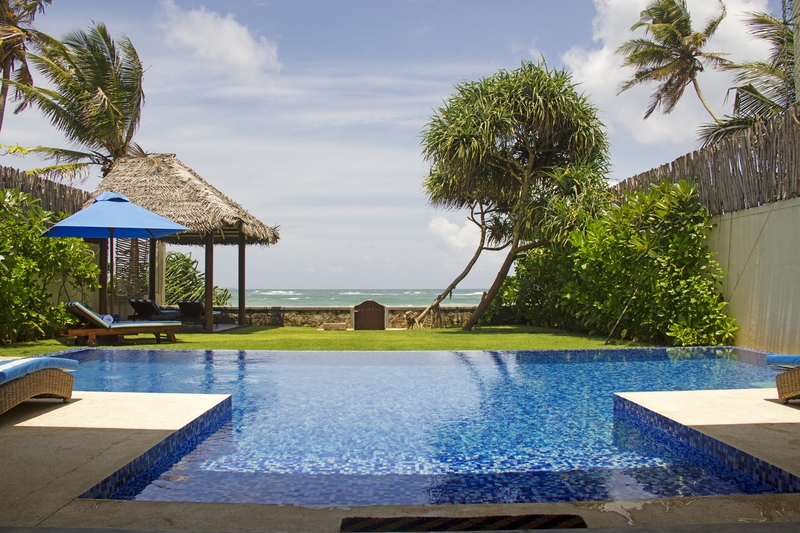 Some of the best luxury holiday rentals in Sri Lanka for family groups! Situated not far from the charming, peaceful town of Induruwa lies Araliya – an elegant four bedroom villa which offers seclusion and luxury in equal measure. Featuring two private balconies upstairs from which you can gaze upon an idyllic ocean view and a large veranda downstairs for sunbathing and socializing, this resort is perfect for a family vacation. One of the most blissful holiday pool villas in Sri Lanka, it boasts two master suites and one junior suite with en-suite bathrooms, as well as a twin room. Enjoy lounging in the suns rays next to a generous swimming pool, which is seconds from the beach. Araliya features spacious dining and living spaces plus a wonderful, part open-plan kitchen with a bar, providing a truly sociable vibe. An idyllic outdoor pool and majestic elevated garden pavilion with sunset views guarantee that Villa Victoria will make for a luxurious retreat. One of the finest holiday pool villas in Sri Lanka, Villa Victoria opens onto a spacious lawn that stretches towards the sea whilst palm trees sway gently overhead. Featuring an exceptionally spacious master bedroom with beguiling views of the sea, you can guarantee total comfort and relaxation. A dedicated and talented chef who specialized in numerous types of Asian cuisine is among the staff here, who can guarantee you won’t have to lift a finger after a long day of exploring the atmospheric buzz of Galle nearby. If enjoying the views of a golden stretch of beach spanning over a kilometre from your own infinity edge pool sounds like your cup of tea then you’d be crazy not to consider Tallala, one of the finest beachfront villas in Sri Lanka. Featuring a lush tropical garden and spacious living area with dining for up to fourteen people, this is the perfect retreat for larger groups. Both the master and junior suites feature bathtubs on the balconies – a unique feature for ultimate luxury which will leave you feeling totally pampered. Admire the sunset with a cocktail to hand from the rooftop garden, which features a small bar and lounge chairs. Tallala House is the ideal spot for weddings, birthdays and reunions – with an open air Ayurveda studio you could even book a group yoga retreat! A luxury lovers paradise fringed by a soft sandy beachfront, Kabalana is truly a slice of heaven – when it comes to luxury holiday rentals in Sri Lanka, this is about as good as it gets. Minimalist and modern, you’ll find paintings of young Sri Lankan artists and various antiques featured in this bespoke resort. Panoramic views of golden sunsets and icy-blue horizons greet you through sheer glass bedroom windows. Kabalana House features separate pavilions, suited both to wining and dining during Sri Lanka’s gorgeous sunsets and enjoying the crisp sea-breeze at sunrise. Well-kept gardens sprinkled with coconut trees lead out to the vast expanse of ocean, giving a true flavour of heavenly beach life. ISHQ Villa is a genuine tropical paradise, placing you within a stone’s throw of the turquoise waters of the Indian Ocean. The surrounding gardens and spacious pool truly are fit for royalty. 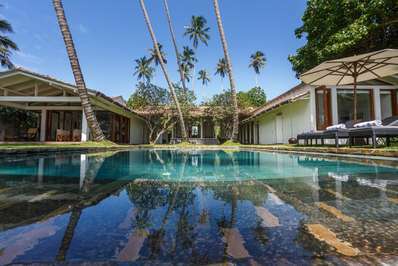 One of the most luxurious beachfront villas in Sri Lanka, this property simply oozes class and elegance – a Dutch-inspired architectural marvel with serene tropical views, it is beautifully decorated and thoughtfully furnished. Included are a range of five-star amenities, not limited to an experienced chef to serve a gourmet menu, spa therapists and a personal fitness trainer. Whether you are looking for a rejuvenating holiday basking in luxurious ambience or want to take advantage of walking tours, cooking classes and nearby heritage sites, there is something for everyone at this tropical paradise. The breath-taking Ani Sri Lanka Estate is perfect for larger groups. With an incredible range of facilities including a 23-meter beachfront pool, poolside bar, spa, yoga pavilion and state of the art fitness centre, you’ll have everything you need to accommodate guests in the fifteen bedrooms. Be it a family reunion, wedding or corporate incentive, this resort boasts a variety of spaces for dining and entertainment – just meters away from the azure ocean waves. Opulent, stylish and spacious, Ani Sri Lanka Estate bushes the boundaries of luxurious holiday-going to a new level. Commanding gorgeous panoramic views and a five-star service team to keep you truly pampered, this is undoubtedly one of the best beachfront villas in Sri Lanka you are likely to find. If you’re still haven’t decided whether to choose Sri Lanka as your next holiday destination, why not take a peek at our list of unforgettable experiences to be had on this exotic island.